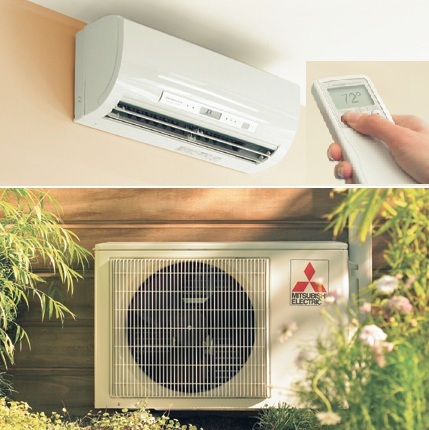 Here at Neal’s Heating and Air Conditioning, our opinion of Ductless heat pumps is that they are the wave of the future when it comes to air conditioning. And we’re the trusted and dependable company to services it in Dalton and other North Georgia cities. In many other countries the conversion from standard, ducted, central heating and air conditioning systems has already been made and the ductless systems are the “norm” instead of the “new thing”. 1) Efficiency: These little machines are built on inverter technology , which in turn only runs on the demand that is needed. In comparison to our traditional systems, (e.g.) If you have a 3 ton unit and your thermostat is set at 72 degrees when the room temp. reaches 73 the 3 ton unit comes on and it runs until it meets the desired temp.. This may be necessary on a peek summer day with outdoor temps of 95 degrees, but how many hours a year could you get by with less than 3 ton? That is the advantage of inverter technology if 1.5 ton is enough than these systems will run at that capacity if more is needed than it has the capability of doing so as well but only if it’s needed. A very Awesome concept! which leads directly to the next advantage…. E.g. a 4 head system… one head in the living room area, one in the kitchen dining, one in the master bdr. area, and one servicing the 2 other bedrooms. The living room could be set at 74 degrees, kitchen/dining @ 72 / mst. bdr. at 68 / and other rooms at 75/ or any other type of scenario. some could be off, or some in heat, some in cool, all at the same time. This is another amazing feature which in turn results in added comfort and efficiency. These are just a few of several advantages these machines offer. Many people ask ” how well do they heat?.” Again this is a feature that has literally astonished me. 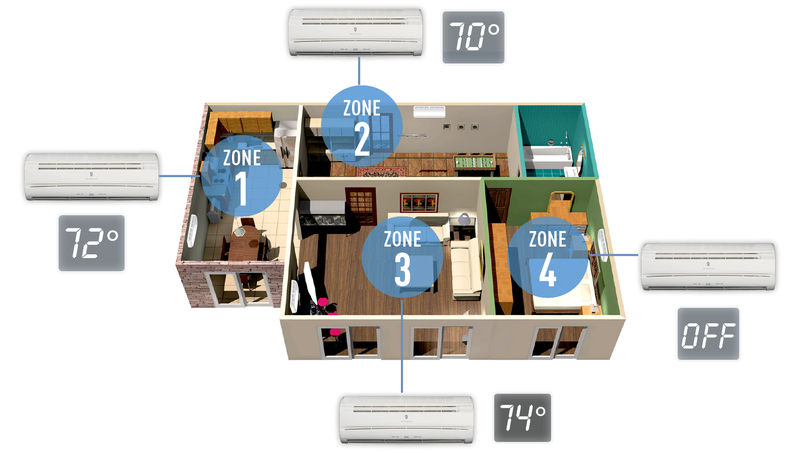 The brands of systems that we use are still producing 100% BTU value at 5 degreed F., in the standard models. There are hyper heat models that continue to produce 100% at below 0 temperatures. Quite amazing little machines to say the least. For more information or details, visit our contact page or give us a call. We will be glad to answer or find the answers to any questions that you may have.